Wheel Locks for custom replacement aluminum wheels that are between 11/16″ and 7/8″ thick at the wheels stud hole and use flat seat lug nuts. Sets contain polished stainless steel washers. *Note: Regular .580″ Shank Locks match Regular .746 Shank Lug nuts, and visa versa. 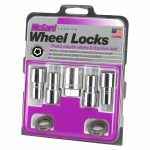 Wheel Locks for custom replacement aluminum wheels that are at least 7/8″ thick, but less then 1-1/4″ thick at the stud hole and use flat seat lug nuts. Sets contain polished stainless steel washers. 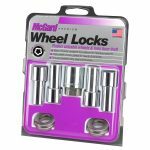 *Note: Long .950″ Shank Locks match Long .946″ Shank Lug nuts, and visa versa. 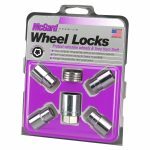 Wheel Locks for use with wheels requiring extra long shanks, such as Cragar/Weld and Weld Racing Wheels. For wheel styles requiring a 1.365″ shank length. Sets include polished stainless steel washers.